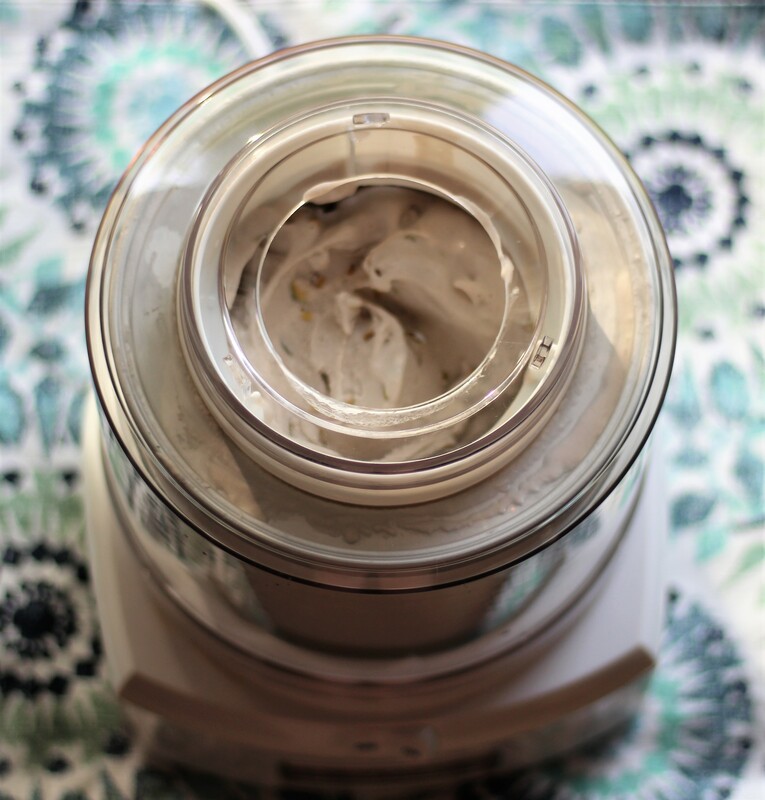 Who would have thought that dairy-free, plant-based ice cream could be so luxuriously creamy? For that, we have full-fat coconut milk and banana to thank. Both are excellent ingredients to use in place of dairy-based milk and cream for our Vegan Coconut-Banana Ice Cream with Pistachios and Lavender Honey. As you may have picked up from following A Cookable Feast, I am not vegetarian or vegan, but I often eat as if I am because I heart plants. And I especially appreciate that this Vegan Coconut-Banana Ice Cream with Pistachios and Lavender Honey is dairy-free because dairy can be problematic for me, as I know it can be for a lot of people. While I love dairy products, this is one instance where I am not missing it. This stuff is GOOD! 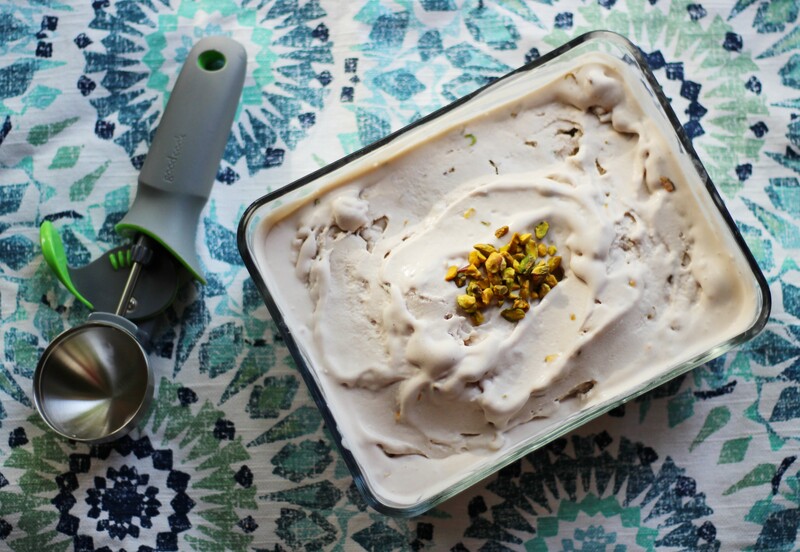 Let’s talk about the two cornerstones of this Vegan Coconut-Banana Ice Cream with Pistachios and Lavender Honey: coconut milk and banana! Besides being incredibly tasty, coconut milk is full of wonderful healthy fats (perfect for mimicking dairy-based ice cream) and is said to be great for gut health as well as reducing cholesterol and maintaining a healthy blood pressure. And bananas are . . . well, I’m pretty biased about their worth, given that they are a staple in my diet; I appreciate them as an easily-consumed-on-the-go healthy snack option and when frozen and blended into my morning smoothies. But more than being an excellent convenience food, they are, as you’ve probably heard, high in potassium (which helps keep the heart, muscles, and nerves functioning happily) and are also beneficial in resolving digestive issues. Yes, we are going to have some happy tummies after eating all of this coconut milk and banana! 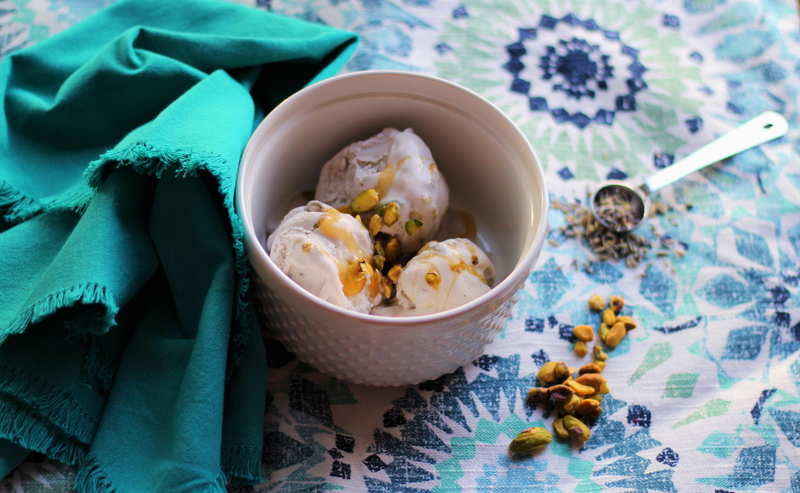 For all of my fellow woo-woo hippie friends out there who are into the chakras, think of this Vegan Coconut-Banana Ice Cream with Pistachios and Lavender Honey as a solar-plexus-enhancing food. Moving on to the other stars of this ice cream: we have pistachios and lavender-infused honey, which are both delightful in their own right. For me, pistachios scream spring – not only because they are the bright green of young grass blades, but also because they have that delicate yet distinct flavor that reminds me of new growth. And lavender! I enjoy lavender year-round brewed into tea, infused in essential oils, and tucked into sachets that perfume my sheets, but it was savoring a rose-infused ice cream at a local tea house that inspired me to use its flavor in this dessert. Admittedly, I can’t taste the lavender flavor in this Coconut-Banana Ice Cream; the fourth-cup of lavender honey that you’ll add to the ice cream is more essential for its natural-sweetening power than anything else. So if you’re leery about trying floral ice cream, know that you can control how much lavender flavor you want to taste by the amount of honey you decide to drizzle on your ice cream when serving. Or you can easily omit the lavender entirely and use regular honey in the recipe. If you are intrigued by the thought of the lavender honey (which is WONDERFUL, I must say) and wondering where in the world you can purchase culinary-grade dried lavender from, you can easily seek it out online from a vendor such as Amazon. I got a half-pound bag of it from Amazon some years ago that is still serving me well from a company called Zziggysgal. Here’s a link to their half-pound bag of dried French lavender on Amazon , which also comes with 10 gauzy purple poptpurri sachets (bonus!). The lavender was labeled as organic when I bought it; it no longer is. But by doing a quick search on Amazon, I see that there are various brands of organic dried lavender available there for affordable prices. Regardless of which brand you decide to buy, having a crap-ton of dried lavender on hand is truly the best, for the aforementioned reasons of being able to brew it in tea (it’s great steeped with dried chamomile flowers) and to make your sheets smell like a field of fragrant wildflowers (swoon-worthy!). Also worth noting: if you are looking for a deliciously creamy canned full-fat coconut milk that features a non-BPA can lining (since scientific studies are showing that BPA is baddie), I found Native Forest Unsweetened Organic Classic Coconut Milk in my local health food store packaged as such. Here’s a link to a 12-pack of it on Amazon . OK, on to the recipe and sweet, sweet plant-based summery goodness! *Note: this post contains affiliate links to products I use and love. This ice cream is so luxuriously creamy, you won't even notice that it's dairy-free! Please note: this recipe requires use of an ice cream maker. Add honey and lavender to a small saucepan over medium-low heat and simmer, stirring frequently, until thinned and slightly boiling. Remove saucepan from heat, cover and let sit in the fridge for an extended period of time, preferably overnight. When ready, remove saucepan from the fridge and put over medium-low heat again, simmering honey until it again becomes thin and has just started boiling. Remove from heat and strain the lavender from the honey by pouring it through a fine-mesh strainer. Store in a sealable container. Add the banana, coconut milk, one-fourth cup of the lavender honey, and vanilla extract to a blender and process until creamy. Let sit for at least an hour in the refrigerator. After the ice-cream mixture has chilled sufficiently, add it to the bowl of your ice cream maker and process per the machine instructions. It should take about 20 to 30 minutes for it to achieve a thick, gelato-like consistency. During the last few minutes of processing, add the pistachios to the mixture (if the ice cream is looking too thick for you to add them to it while it's in the ice cream maker, you can mix them in to the ice cream manually afterwards). And you're done! You have a richly creamy, plant-based frozen treat to enjoy. Serve topped with extra pistachios and drizzled with the remaining lavender honey.